Written by Alonzo Solano One the most recognized heroes in Costa Rica history is no other than a war fighter who put his life in danger a long time ago to end a dispute against the Nicaraguan filibusters, and give his country a new reality. Lots of tourists use the airport with his namewhen they come for their costa rica travel vacations, but the majority don’t know the reason of the designation. Juan was a soldier in Costa Rica. It is one of the two national heroes officially recognized by the Republic of Costa Rica, along with former president Juan Rafael Mora Porras. He is remembered because it was the one who burned the so-called "Meson de Guerra" at Rivas, Nicaragua, during the Battle of Rivas, on April 11, 1856, as part of the National Campaign of 1856-1857 and the National War Nicaragua. In the inn, the buccaneers were led by the American William Walker. This act contributed to the Costa Rican winning the battle, but also cost him his life. Although the heroic act of Juan Santamaria was a fact of common knowledge from the very date of the Battle of Rivas, it was not until the year 1891 when he began to idealize as a national hero of Costa Rica, in the midst of a time factor for the consolidation of the Costa Rican national identity. 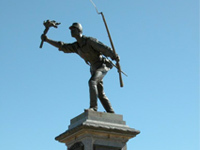 There is a bronze statue of Juan Santamaría is located in the Alajuela Park named after the hero, where the airport also is. It was made in France by sculptor Aristide Croisy (1840-1889) and fused by Eugene Antoine Durenne. The statue is costa rica attractions because of its history, and it represent the heart of a true hero. April 11 marks the date in which Juan Santamaría is officially declared by the Costa Rican authorities as a national hero, despite the civic festival in honor of the soldier was being held in Alajuela nationwide ritual since 1915.